Bethany Jewell, right, has already had surgery to repair the ACL in both knees. As a freshman, Bethany Jewell has already distinguished herself as an up-and-coming leader on her United Local High School soccer team in Salem, Ohio. 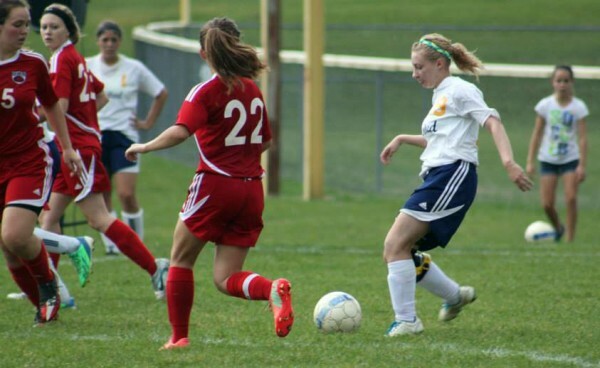 She has been honing her skills since age 6 and also competes on a highly competitive club team, Keystone Premier. 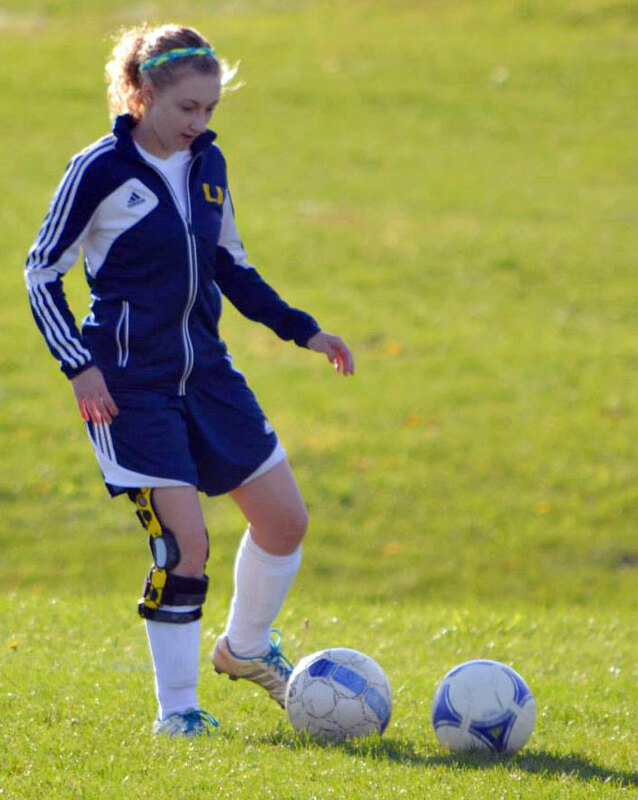 But, at age 15, she has already had surgery to repair the anterior cruciate ligament (ACL) in both knees. Painful, season-ending ACL injuries are up to 8 times more common in female athletes than their male counterparts. An ACL surgical repair requires at least 6 months of rest, intensive physical therapy, wearing a knee brace for a year, and a gradual return to play. In trying to explain the higher rates of ACL injuries for female athletes, theories have pointed to differences in bone structure and mechanics. Girls tend to be more knock-kneed than boys and land jumps with their knees straighter and closer together. An additional consideration may be hormonal differences since ligaments are more lax during menstruation. But, in a groundbreaking study, Dr. Kerwyn Jones, chairman of orthopedic surgery at Akron Children’s (and Bethany’s surgeon), found genes may explain the differences. The study, presented at the annual meeting of the American Academy of Orthopedic Surgeons in March, identified differences in genetic material of ACL tissue of young men and women. The research team, led by Dr. Jones and William Landis, PhD, the G. Stafford Whitby professor of polymer science at the University of Akron, obtained a biopsy of normally discarded, ruptured ACL tissue during surgery from 7 male and 7 female athletes. Biopsies underwent microscopic and gene microarray analysis. The focus narrowed to 3 genes not found on the X- or Y-chromosomes. The differences in expression of each of these genes result in differences in their counterpart proteins. These proteins could significantly weaken the structure of the ligament in the female compared to male athletes. While you can’t change genes, there are proven exercises and prevention programs to help female athletes reduce their risk of an ACL injury. Dr. Jones would like to see these introduced to all female athletes starting in middle school. The research could also have implications beyond ACL injuries. According to the American Academy of Orthopedic Surgeons, about 200,000 ACL injuries occur annually, with about half requiring surgery. As for Bethany and her parents, they were just glad to learn that such a nationally-known expert in ACL repair was just about an hour away from their home. Bethany was 1 of 3 freshmen to play with her school’s varsity soccer team this year. The team won its league championship and went onto become the district runner-up. She’s still growing, getting stronger and looking very much forward to 3 more years of high school play and perhaps also playing in college.